And so I have returned to the land of bikes and wind and sea and pastry. This weekend was spent getting back into the swing of things and back onto the Danish clock on Bornholm, the island where my husband’s family has a seaside cottage. It’s a pretty idyllic place where days are spent in a blur of eating, reading, napping, and perhaps a walk if we’re feeling ambitious. Naturally this kind of dreaminess leads me to the “kitchen” (the beach) where I have a spectacular view of the ocean, salty sea air in my lungs, and a roaring fire to cook over. While my man is usually preparing something of the pork persuasion for himself, I get to play with the grill veggie-style. Or in this case, fruit-and-cheese style. I first discovered halloumi last autumn while I was in London. It seemed to be absolutely everywhere – from the uber-fancy restaurants, to the cheap and cheerful take-out shops. What was this mysterious halloumi and why was it donning every menu like some ubiquitous, common fare that I had never seen before? Well, you can imagine my delight when I found out that halloumi was a cheese made out of…wait for it…sheep and goat milk! Hooray for life! Hailing from the island of Cyprus, halloumi cheese is un-ripened, semi-hard, and brined and kind of like feta, but with different qualities. Firstly, halloumi has a distinct layered texture and a very salty flavour. Its most notable feature however, is its very high melting point, making this cheese uniquely grill-able. You can also fry halloumi into crispy, golden cubes for an interesting addition to salads and warm vegetable dishes. Soooo scrumptious. Traveling south to Egypt we find the origins of dukkah – a nut, herb, and spice blend that is traditionally used as a dip for bread or fresh vegetables. Although there are many different versions containing a plethora of various ingredients, I kept mine fairly simple with hazelnuts, sesame seeds, coriander, cumin, salt and pepper. I had actually not tried this versatile condiment until this weekend when I made a batch specifically to garnish the grilled peaches and halloumi. My instincts told me that they would be a super delish combo, and blessed be; I was right on the money. The roasted nuts and seeds add richness to the juicy grilled peaches, and the crunch was a welcomed addition to the relatively soft textures of the fruit and cheese. Since then I have tried sprinkling dukkah on salad, grain dishes, avocados and eggs – all delicious! This is a very easy thing to whip up and have on hand to liven up just about any meal. It’s nutty, it’s toasty, it’s savory and spicy! A jar of this would make a great gift. 1. Wash and cut peaches into 8ths, removing the pit. 2. Slice the halloumi into 1” cubes. 3. 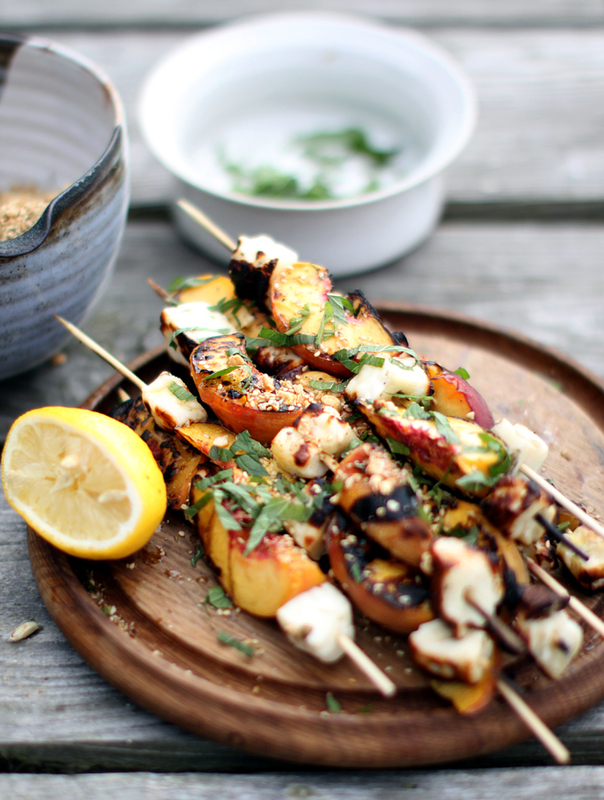 Skewer the peaches and cubes of halloumi. 4. On a medium-hot grill, cook the skewers on one side until the peaches have charred just slightly and the cheese has browned in places, then flip the skewer and cook until the other side is done (about 2-3 minutes per side, depending on the heat of your grill). 5. Remove the skewers from the grill and place on a serving platter. 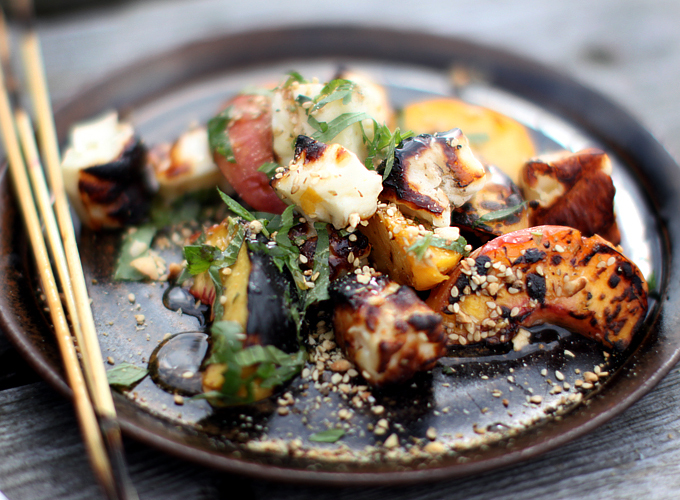 Drizzle the skewers with honey, a little olive oil, a handful of chopped fresh mint leaves and a good douse of dukkah. Serve immediately. 1. In a dry skillet over medium heat, roast coriander and cumin seeds until fragrant, about 2 minutes. 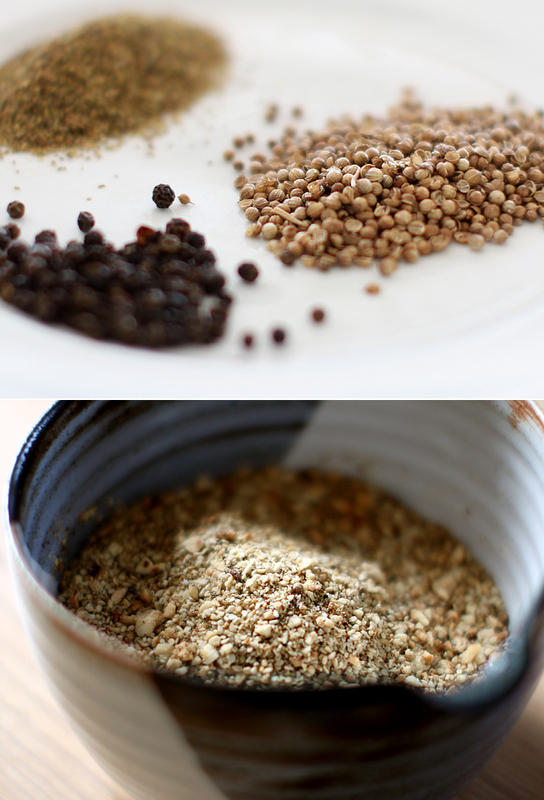 Place in a mortar and pestle and pound together with the peppercorns until pulverized (or grind in a coffee mill, or in a food processor). 2. In a dry skillet over medium heat, roast hazelnuts until fragrant, about 10 minutes (watch them carefully so that they don’t burn). Put hazelnuts on a plate to cool. When cool enough to handle, rub the nuts together to remove the skin. Place in a food processor. 3. In the same skillet, roast sesame seeds until fragrant and they begin to pop, about 2 minutes. Let cool slightly. Place sesame seeds in the food processor with the hazelnuts. Pulse to chop hazelnuts until a chunky-sand texture results (do not blend as you will end up with hazelnut-sesame butter! Tasty yes, but not what we’re after). 4. In a large jar or bowl, empty the contents of the food processor and add the spice mix, along with the salt. Taste and adjust seasoning if necessary. Store in an airtight glass container for up to one month. 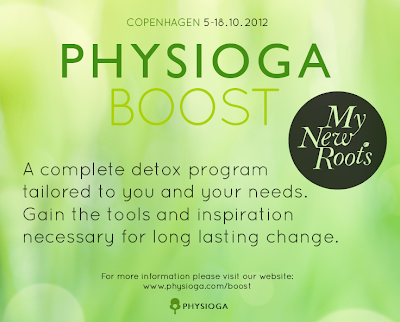 I am very excited to announce my first collaboration with a holistic therapy center here in Copenhagen. We have put together an intensive, two-week detox program designed to give you the tools and inspiration you need to make long-lasting changes in your life! I will be giving cooking classes and lectures on nutrition while guiding participants through a 14-day cleanse, including a juice fast. Participants will receive daily treatments in reflexology, full body massage, craniosacral therapy and yoga. This program is open to anyone in the world! Come join us in Copenhagen for this very special program. Learn more here. 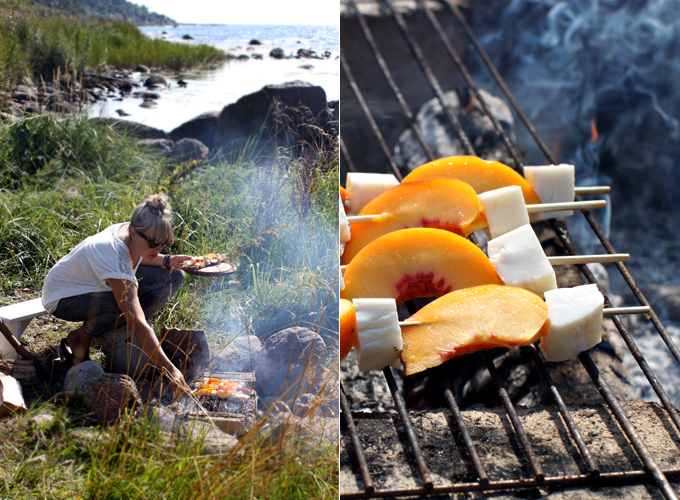 Ooohhhhh YES, I should try this:-) Grilled fruit just screams ‘summer’, right?! Dukkah – you store in the fridge or room temperature? it really looks like kebab but its completely new recipe, I like new ingredients that you have mentioned above and will try this at my home rather ordering food delivery from restaurant. I will try this next time with the cinnamon, but the I was leary of it, and I used alspice instead. I served it with yougut and cucumber salad and tobulia. They were very good, next time I will try half a batch with cinnamon and the rest with alspice just cause we liked the flavor so much. Wow, thanks for that great read … Halloumi is one of my favorite cheese, I usually put slices (fried in a little olive oil first) in my lettuce salad … Just delicious !!! Which is not a thing I normally do! Thanks a whole lot! Be sure to no snide comments!!!!. What a fabulous combination of flavours and textures Sarah! and a great dukkah recipe too. Thank you! Why are there all these comments, that have to do with spells and dubious email addresses to get said help and not your recipes, on here. It is off putting and sure reeks of spam. However your site is lovely but I wonder if you actually read the comment section. I do look forward to your emails. Thank you. This is beyond gorgeous. I love it! I cook regularly for my sister (confirmed veggie) and my boyfriend (confirmed meat eater) and am always looking for ideas that will please them both. When something is this delicious the meat eaters in my life (myself included) are quite happy to forego the flesh for a meal. Great with zaatar beetroot dip. thanks. gorgeous website and GORGEOUS photos of the lovely creations. Ok, so I’ve made this twice already and just put in on my meal planner for next week as well! Delicious. All elements on their own are lovely but together they really shine. I had tried dukkah only once before so was keen to mix my own. I’ve now got a jar of it stored away for easy access. Just made this tonight… it was so freaking delicious. Thanks much for the continuously wonderful recipes. it is looking so delicious! great meal and great images..very inspiring.. I love the unique qualities and flavor of halloumi as well. Beautiful post! I love Halloumi cheese originated in Cyprus and was initially made during the Medieval Byzantine period, subsequently gaining popularity throughout the Middle East region. Halloumi (Greek χαλούμι, Turkish hellim, Arabic حلوم ḥallūm) is a Cypriot semi-hard, unripened brined cheese made from a mixture of goats’ and sheep milk, and sometimes also cows’ milk. It has a high melting point and so can easily be fried or grilled. Halloumi is set with rennet and is unusual in that no acid or acid-producing bacterium is used in its preparation. I discovered peaches with dukkah last summer- oh how I loved it. And then the whole year went by and I subsequently forgot how delicious it was. Thanks for the reminder! Just in the nick of time! that looks mouth watering-ly good! 🙂 gorgeous photos too! Beautiful. Thank you for your ideas. Thank you for the halloumi lesson, and the recipe looks delightful. OMG, OMG, OMG! I CANNOT wait to try this! It really is a beautiful scrumtious-looking recipe. Sarah. you never cease to impress! I love your blog! I’m so glad that I happened to stumble across it. I am always looking for seemingly unusual food combinations and am so excited to try many of your recipes! Peaches and halloumi, oh yes! The two just seem meant to be. I am going to a bbq tomorrow so this recipe arrived just in time. A few years ago a friend brought some halloumi and veggie skewers to a bbq and ever since I have been making a version each bbq season (aka summer) where I marinated the halloumi for a few hours in lemon juice and olive oil with fresh rosemary. I love the idea of peaches and I think that I’ll add some red onion as well (because I just can’t get enough). Can’t wait to try this recipe! Your vacation sounds like a dream! I can not wait to try my hand at making dukkah and I have yet to try halloumi but as soon as I can get my hands on some I will try it. We have a lovely goat farm right near my house so I will have to ask the owner. 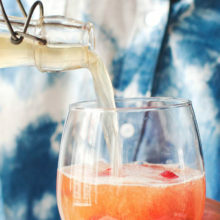 Sounds like an amazingly relaxing vacation with lots of fun and interesting flavors! Beautiful photos! Sounds like a delicious dish. I can’t wait to make that brilliant spice mix. I can’t believe I’ve been following this blog for almost a year and I’ve never left a comment, haha! 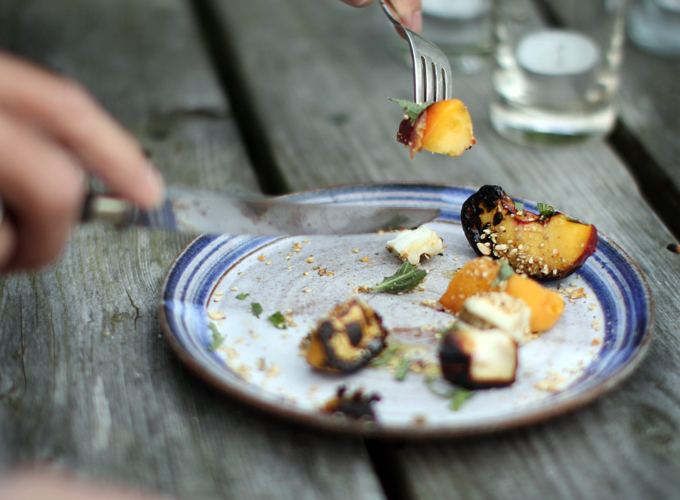 I would never have thought to combine peaches, halloumi, and dukkah- such a great idea! I fell in love with Dukkah many years ago after coming across a recipe for it on some long forgotten site, or book or something. I’d never heard of it, but the crushed combination of nuts and spice and everything mixed up together was a siren call I couldn’t ignore. One batch, two, three and countless others since then, I’ve cheered when seeing other food lovers talk about this incredible condiment. I think it’s time for another batch. I love how your brain puts tastes together. You really have a special gift. Thank you for sharing it. Once you again you’ve managed to read my kitchen’s brainwaves and combine some of my favorite ingredients in new ways. (: Dukkah and halloumi are both so scrumptious that they deserve each other, I reckon. This looks like a fantastic combo. Haloumi tastes good with (nearly) everything. If I could even dream of getting my hands on those ingredients here I’d make this recipe asap! I may not be able to source halloumi where I’m at but I must try that dukkah. Our peaches should be ready to harvest in about 2 weeks, and right now grilling them (either over coals or on a cast iron griddle) is tops!